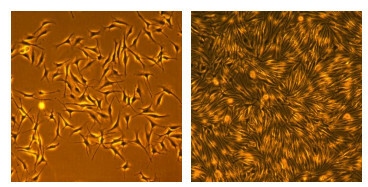 DermaLife M culture medium is a low serum, PMA-free, Cholera toxin-free medium optimized for the culture of Human Epidermal Melanocytes – Neonatal (HEMn). DermaLife M supports the growth of these melanocytes over a period of at least 15 population doublings. DermaLife Basal Medium contains no antimicrobials and no phenol red, which are not required for eukaryotic cell proliferation. DermaLife Basal Medium in a light-protected 500 mL bottle. 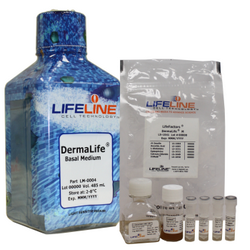 DermaLife M LifeFactors® Kit (associated supplements and growth factors) are packaged in a convenient gas-impermeable pouch for easy storage. DermaLife M Medium grows Human Epidermal Melanocytes -Neonatal (HEMn) through at least 15 population doublings at rates that exceed other commercially available media containing PMA or cholera toxin while maintaining excellent cell morphology and LDOPA Oxidase activity. In comparisons with other commercially-available media, DermaLife M shows superior proliferation at different seeding densities over a period of 7 days without media replacement. Shown above left: Human Epidermal Melanocytes -Neonatal, passage 4, 3 days after inoculation with 2,500 cells/cm2(100X). Shown above right: Human Epidermal Melanocytes -Neonatal, passage 4, 6 days after inoculation with 2,500 cells/cm2(100X). Shown below: Human Epidermal Melanocytes -Neonatal inoculated at the stated density in 24-well plates and stained with crystal violet on Day 4 or Day 7. Higher O.D. 590 represents a greater number of cells per well, and therefore, better proliferation.